Harsh spring weather has caused up to 15 American and Canadian ships to become stranded in ice-covered Lake Superior, with coastguards working on a rescue operation. One of the freighters has been damaged by the crushing grip of the ice. 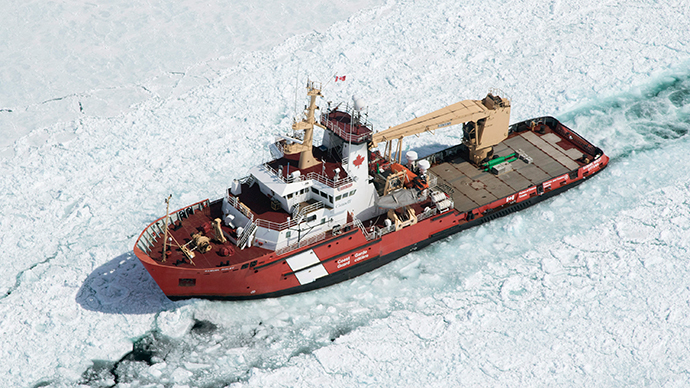 Canadian icebreaker Pierre Radisson on Wednesday set out to join other rescue ships to help break the ice in Whitefish Bay, according to the US Coast Guard. Some of the vessels have been stranded since Sunday. “They’re just waiting ... for us to get a track through it,” the director of vessel traffic services for the US Coast Guard at Sault Ste. Marie, Mark Gill, told the Detroit News. Local media are citing somewhere between 10 and 15 ships are affected. One of the stranded vessels – the Kaye E. Barker freighter – was damaged by the ice, sustaining hull damage. It is scheduled to be inspected, after it moves all of its cargo to another ship. Gill added that the ice loosened and was pushed to Whitefish Bay in Lake Superior by warmer air and westerly winds. “Because of the way the ice is packed in, the proverbial drain is clogged and no one is moving,” Gill said. It is uncommon to see this much ice along the shipping route between Michigan, USA, and Ontario, Canada. The shipping season on the Great Lakes began in March. Rescuers’ main task is to break a path within the ice for the ships to use, spokeswoman for the Canadian Coast Guard, Carol Launderville, said in a Tuesday statement. “Once those tracks are established, then direct escorts through these very challenging ice conditions will be made, and the ships can get underway to various locations throughout Lake Superior and toward the St. Marys River,” the statement said.